Benny Lewis: Fluent in 3 Months | Sprechen Sie Deutsch? Benny Lewis is a self-proclaimed failed language learner…. yet is now also a polyglot, having mastered a dozen or more languages in varying degrees. It wasn’t, however, until his 20s that he figured out how to approach language learning. He failed miserably acquiring languages for the Irish leaving cert and couldn’t speak Spanish even after spending six months in the country. It’s only when he changed his outlook towards learning Spanish that he made any progress. He now runs the language hacking website Fluentin3months.com and is a digital nomad whose entire worldly possessions fit into a 50lb bag. He is one of the few genuine Irish Internet success stories and one of the only Irish guys (if not THE only one) to be invited to a TedX Talk. He has now consolidated his approach to language learning in a new book published by Collins, also boldly called Fluent in 3 Months and is currently doing an extensive book tour through the UK, Ireland and the US (as well as some other parts of the world) and I took this opportunity to attend the event in Waterstones in Cork where he first gave a little 15-minute presentation, then answered questions from the audience before moving on to the signing. So…. 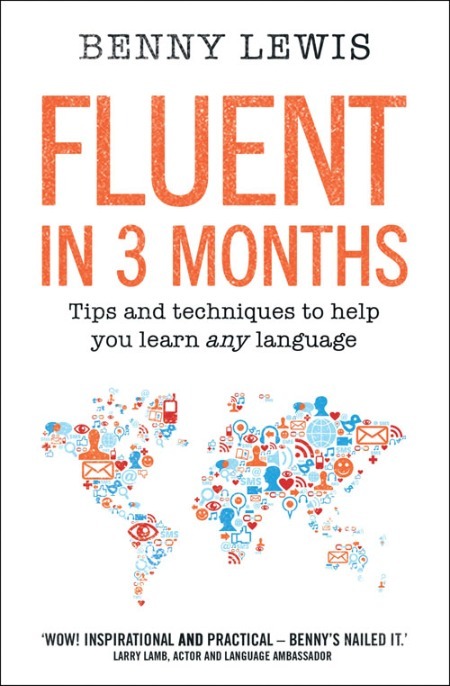 Fluent in 3 months? Seems like quite a promise, especially for people who may have struggled with languages before. Is he selling snake oil? But the title does bear some explaining. For starters he defines “fluency” as being able to express yourself in a social setting in a flowing style of talking without too many hesitations. In other words somewhere between B1 and B2 is where he would be aiming for. He acknowledges that there are various other ideas of what constitutes fluency in a language and for the later stages C1/C2 he uses the term “mastery”. On his site he had once mentioned that the 3 months part of his domain name is not a promise but a goal or a challenge and he is very keen on setting yourself precise targets and mini-missions and if 3 months may prove too short for your goals, then 4 months or 6 months could also do (or indeed just a week or two for smaller challenges). In the book he emphasises that the 3-month goal is not achievable with just an hour per week here or there but does require full-time studying during that time frame (or at least two hours per day). So with a minimum of 180 hours (but up to 720 hours if done “full time” properly), it’s safe to say that reaching levels around A2/B1 or slightly higher is indeed within the realm of the possible. Benny quickly ditches a number of language learning myths. It has e.g. never been scientifically proven that children are indeed better geared towards language learning and there is at least one study that shows that adults are actually far better wired towards acquiring new languages. If kids have one advantage then it is the fact that they are surrounded by better “teachers”, i.e. parents who constantly encourage them and provide non-stop feedback. In other words: if there is a possible advantage, it is a question of nurture over nature. His main point about acquiring new languages is to speak from Day 1. There really has never been a better time to learn a new language. If you don’t know anyone in your neighborhood who can help you speak, learn and communicate, then there are now scores of opportunities that can hook you up with language exchange partners and tutors online. He keeps traditional academic approaches focusing on grammar to a later stage in his studies and also doesn’t bother much with reading or listening and film watching exercises at the early stages. This is one of the few points where I may ever so slightly disagree with him. I love to surround myself with various media and foreign language input right from the start and am somewhat dubious whether it really is a good idea to keep everything grammar related to a later stage when it is more difficult to unlearn a number of bad habits but, hey, who am I do argue with someone who has clearly been more successful than me in acquiring a large number of languages? Plus, Benny openly admits that there is not one sure fire way in this regard and the important thing is just to set yourself precise missions and then find your own path to glory and see what methods work for you and which don’t. All in all this is a fun and encouraging book, primarily aimed at people who have so far struggled with learning languages. Those who have already mastered one or more may not get all that much more out of it but even then one does find occasional nuggets: One suggestion he has for the mastery stages of language learning when a lot of the basics are already in your blood is not to find a tutor but a speech therapist or voice coach to help with the proper enunciation. The book is kind of an offline summary of his online ideas and will likely introduce him to a new audience that may not yet be all that familiar with him. If you have already followed his website extensively, then a lot will of course already sound familiar. Still, it’s great to have all his tips and tricks combined in one book. This entry was posted in General, Online Language Tools, Reading, Review and tagged Benny Lewis, Books, Reviews by holgerhaase. Bookmark the permalink. Benny Lewis generally gives good tips on language learning. However, he’s plain wrong when he moves within the field of neuroscience. Adults can be good language learners, but not better than children. Children are better at language learning. As a matter of fact, they do not learn, but acquire the language subconsciously. They learn the language at the same time as they develop their emotional regulation systems. In other words, they learn the language through perceptual channels that become integrated with the limbic system. While a child learns any language instinctively, adults need to turn to their intelligence to learn the rules. This makes adults more intelligent, but not better language learners. The fact that adults make use of their intelligence to learn a new language is good, but it is not an advantage in relation to children, who accomplish the same task effortlessly. Adults have the cognitive strategies to start a language journey for which children do not need any strategy at all. If you’re learning Spanish, you’ll have to study the distinction between “ser” and “estar”, “por” and “para”, the subjunctive mood or reflexive verbs. Those are concepts that Spanish children understand instinctively without any need for formal instruction. Adults have to make a conscious effort to learn something that children acquire naturally. Why would people struggle so much with German declensions if they could learn them better than German children? If you carry out grammar tests with adolescents or adults, they will perform better than children, since they are making use of their intelligence. What these experiments prove is that adults are more intelligent, not better language learners. In fact, having no grammar is an advantage for children, since they build their grammars at the same time as they learn the language. They do not need to compare the new grammar vs the old grammar. In other words, they do not have a language whose grammar and vocabulary interferes with the new one. The fact is that children 0-5 do not find it difficult to learn a language while adults do. If adults were “better wired” than children, why would there be so many language learning methods, teachers, books, language schools, bloggers, etc? The article Benny mentions to support this point of view was presented at the 12th International Congress for the Study of Child Language (http://bit.ly/1hdOPym) by Sara Ferman (Tel Aviv University) and Avi Kami (Haifa University).